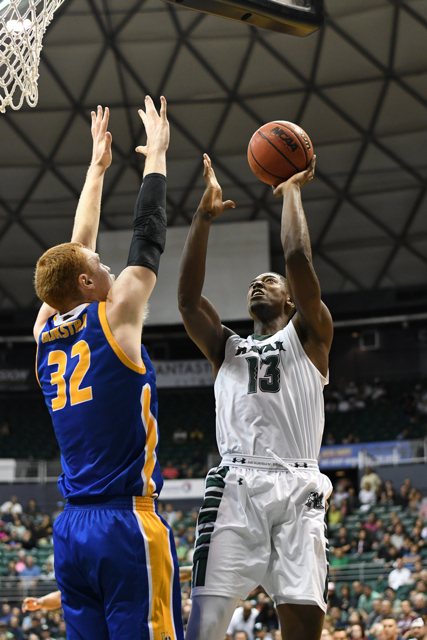 Flipping the script by surprisingly transforming from prey to predator, UC Riverside pounced on unsuspecting Hawai’i Wednesday night and rallied past the host Warriors, 64-60, in stunning Big West Conference men’s basketball. 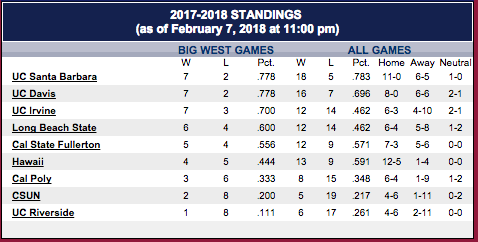 A befuddled Stan Sheriff Center crowd of 5,206 (tickets issued) watched Menno Dijkstra finish with a team-high 17 points and six rebounds and Chance Murray add 16 points and six assists as the last-place Highlanders improved to 6-17 overall and notched their first league victory against eight losses. Mike Thomas scored a game-high 18 points, Brocke Stepteau added 11 points and Jack Purchase grabbed a game-high 10 boards for Warriors, who fell to 13-9, 4-5 with their fourth straight loss. 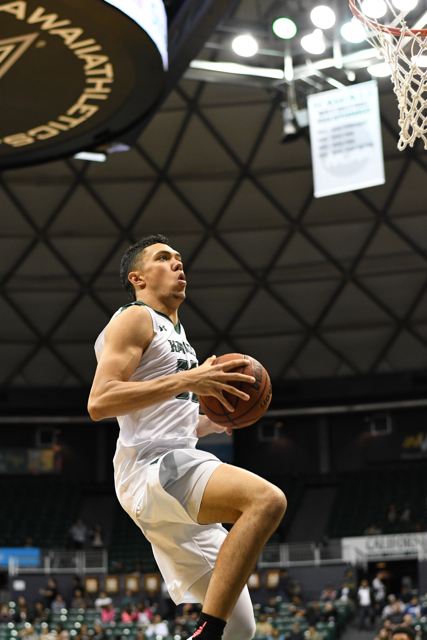 Hawai’i remained in sixth place, but is now three games behind the conference leaders with seven games remaining in the regular season. “Tough one today,” UH coach Eran Ganot said. “I gotta do a better job of getting our team back to where we were … (at) the highest level of commitment, leadership, attitude, effort. You can’t have it spots, (it has to be) every single guy. We’re going to back to work like we always do, we’re going to handle it with class, like I hope we always do. Give (UC Riverside) credit … and then go back to work and see what you can fix. After a rocky first half, the Warriors led for much of the second half until Murray drained a 3-pointer with 2:28 remaining to put the Highlanders ahead, 55-53. Shortly after that shot, Ganot was assessed a technical foul – the first of his career – for arguing a non-call on a drive to the basket by Thomas. UCR’s Koh Flippin made one of the two free throws awarded for the tech to give the Highlanders a 56-53 lead. 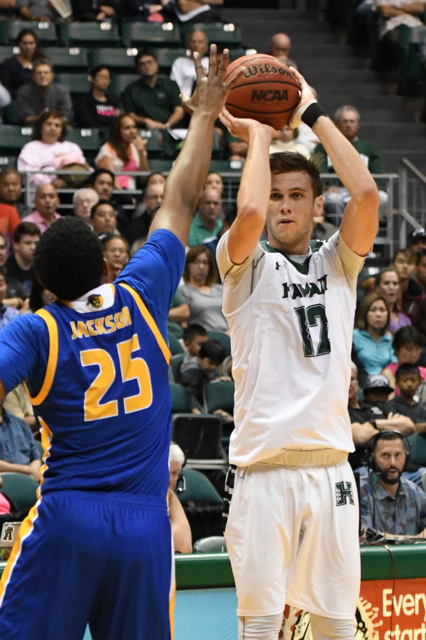 Hawai’i stayed close and trailed 62-60 after Stepteau’s 3-pointer from the left wing with seven seconds remaining, but Dijkstra sealed the victory with two free throws one second later. Despite the appearance of UC Riverside stealing the victory at the end, Thomas said the Warriors let it slip away long before that. In an unexpected last-minute shakeup, Ganot promoted young reserves Zigmars Raimo (a sophomore) and Samuta Avea (a true freshman) into the starting five, along with former starter Jack Purchase, a junior who had not started since the Nevada game way back on Nov. 24. Usual starters Thomas, Gibson Johnson and Sheriff Drammeh were relegated to reserve roles. “I thought the guys who were in there, deserved to be in there,” Ganot said. Thomas and Johnson – the only two seniors on the team – had started all 21 of the previous games this season. After UH took a brief 13-12 lead on Leland Green’s 3-pointer from the right wing, the Highlanders responded with a 9-2 run capped by Eric Rwahwire’s 3-pointer to lead 21-15 midway through the first half. The Warriors then chipped away and Green’s coast-to-coast fast break layup just four seconds before halftime tied the score at 30-30. After the horn, UCR interim coach Justin Bell was called for a technical foul, and so Hawai’i actually took a 32-30 lead on Purchase’s two free throws immediately prior to the start of the second half. The Warriors later expanded the lead to 47-40 on Thomas’ layup any the midway point of the second half, but the Highlanders employed a three-quarter court press soon after and UH only managed one field goal over the next nine minutes. The Warriors have two days to regroup before taking on Cal State Northridge at 7 p.m. Saturday at the SSC. Ganot said if they cannot do so, they are vulnerable for a repeat outcome. 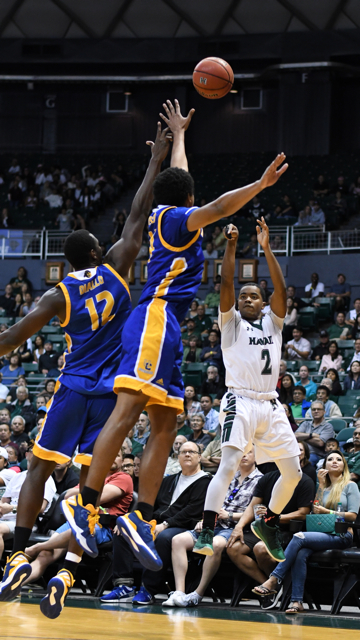 The last time a Hawai’i team had a four-game losing streak against conference opponents was in 2012, when the Warriors were in the Western Athletic Conference. CSUN at Hawai’i, 7:00 p.m. Stunned is the right word. I still can’t believe it. Johnny White and Hallums said on the TV postgame show that maybe something happened in the locker room and that’s why all the main players got benched. I missed the start so I didn’t even know the lineup got changed until they mentioned it at halftime. I can’t believe they started Raimo. Really? I think that totally set the tone for the rest of the game. What ever happened to Ido, is he hurt? He was showing some potential earlier but now he don’t even get a chance to play. The last 4 losses in a row exposed coaching..fan interest..and lack of 10 deep at least BigWest talent. Would not be surprised if csun upsets warriors on Saturday. Warriors have to play better defense and go inside out on offense. None of other 8 bwc teams fear UH now. True.. BigWest tournament crown and NCAA bid any team including Hawaii can win it. If Warriors lose to csun this Saturday ..it will be a real set back..warriors would be in trying qualify to make bwc tournament. Eran has to coach and motivate better and get some top usa athletic basketball talent frosh . Transfers or jc recruits. 3014 in house..attendance sounds like Frank Arnold . Early first year Wallace years. Well..hope men volleyball team goes far in NCAA tournament! Hope best for Mike and Brocke so important holdovers! After 3 losses..Eran shakeup lineup..remember..warriors were leading majority of game..those technicals concern..probably warriors and coach figure guaranteed win ..warriors would pull it out…last few minutes when Riverside hit 3 key shots..that was it..hats off to Riverside for win on road. Eran has to start regulars run their half court offense ..they beat csun handidly. Hope 7000 in house attendance..only 3 more home games. Warriors fall to 4-6 problem.. Totally unacceptable performance. Da Bows played like a high school team last night. Absolutely poor shooting, 33% ain’t going to do it, against the worst team in conference. ! Whose got the worst team now. ? Come on Warriors play every game like your last! You’re regressing. At this juncture we should have split on the last road trip and won this last game.! !This team chokes and can’t sustain a 7 point swing. Too many turnovers, missed layups and on. Saturday is a MUST WIN. ! Come on guys get your act together. Protect the house ! No one should some to our arena and come out with a W! The only thing they’re going to go home with are bruises !